Both Old Testament and New Testament provide illustrations of men who honor themselves, and the folly of doing so. The elder John wrote of a man named Diotrephes “who loves to be first” among his brethren (3 John 1:9). In the Old Testament no case is more prominent than that of Absalom the rebellious son of David. 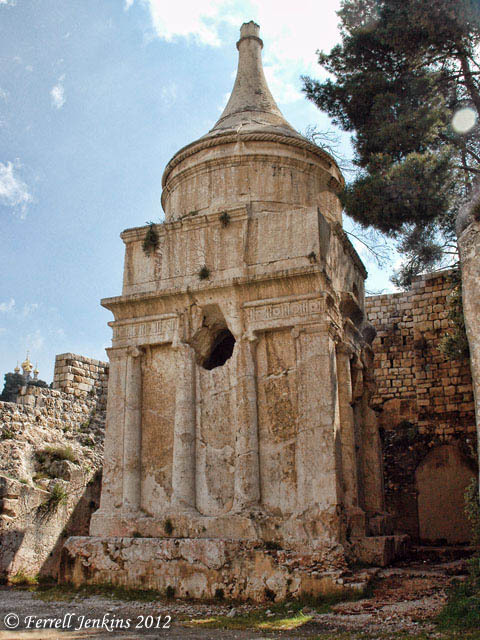 In earlier times it was common for pilgrims to the Holy Land to be told that this or that structure belonged to a certain Biblical character or event. I will show you one such example. The photo below was made in the Kidron Valley with a view to the south. On the right you see the eastern wall of the Old City of Jerusalem. On the left of the photo, where the valley becomes narrow, you can see the top of the monument called Absalom’s Pillar. An image suitable for presentations is available here. This photo would look good in PowerPoint. There is room on the upper left side sky to include appropriate scriptures. Kidron Valley view to the south. Photo by Ferrell Jenkins. In AD 1170 Benjamin of Tudela associated this monumentsin the Kidron Valley with the monument of Absalom. The monument actually belongs to the early first century B.C., and not to the time of Absalom. It is a funerary monument in front of an eight-chambered tomb. A closeup view of the monument may be seen in the following photo. Absalom's Pillar. Photo by Ferrell Jenkins. Soon I plan to explain what this monument might have to do with Zacharias, the father of John the Baptist. 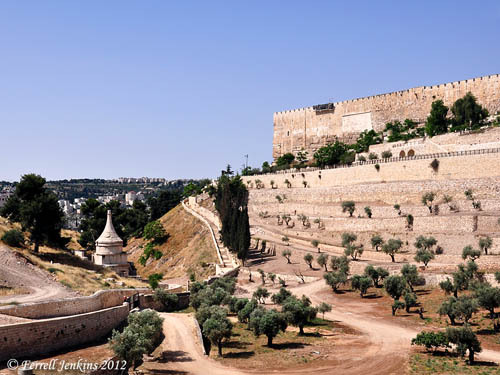 This entry was posted in Bible Places, Bible Study, Culture, Israel, New Testament, Old Testament, Photography, Travel and tagged Monuments. Bookmark the permalink. Yes, I have been told that by guides when visiting the Umayyad Mosque. Other places also claim his head. Perhaps I will pull together some of this in a later post. John was highly esteemed, improperly in my judgment, in the Byzantine period. I appreciate your comments. Legend has it that the head of John the Baptist is kept in Damascus, Syria at the Umayyad Mosque, or Great Mosque, which was at one time a church. Have you ever heard this account?